If you are in Bangkok or in Thailand and you have not tired street food, then you are not really here nor visiting here. 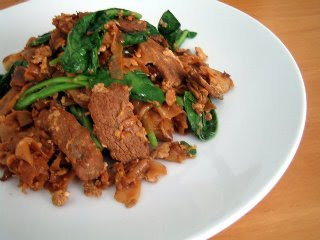 "Pad-See-Ew" is very common & popular in Bangkok. You can easily find it at any corners. Anyway, I know this dish looks very dodgy but trust me. It’s so very good and it’s very easy to cook at home. Find here below a recipe of "pad-see-eiw"
Heat 4 tablespoons of extra light olive oil in a wok or a frying pan, wait till becoming hot. 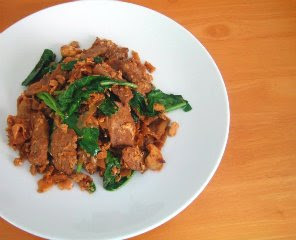 Add the sliced pork, and stir-fry for 2 minutes till almost cooked. Add the noodles, keep stirring to break the noodles, turn them over a few times. Add in oyster sauce, fish sauce, black soy sauce, seasoning sauce, light soy sauce, & sugar. Stir-fry to combine everything well. Serve with a small cup of hot chili in vinegar sauce. Score!I needed a recipe for this.I have everything else to make it, but where can I find "Seasoning sauce"? I would like to do it for my grandma ka..it's not spicy menu that she can eat..